Yay, now I can say “I look into stuff” and actually be precise about what I have been working on (and get it published, too! ), rather than just oversimplifying into vagaries about some of my research topics. The final title of the paper I settled on is not as funny as proposing a ‘pointless theory’ , though: it’s a Core Ontology of Macroscopic Stuff , which has been accepted at the 19th International Conference on Knowledge Engineering and Knowledge Management (EKAW’14). The ‘stuff’, in philosophical terms, are those things that are in natural language indicated typically with mass nouns, being those things you can’t count other than in quantities, like gold, water, whipping cream, agar, milk, and so on. The motivation to look into that was both for practical and theoretical reasons. For instance, you are working in the food industry and thus have to be concerned with traceability of ingredients, so you will have to know which (bulk) ingredients originate from where. Then, if something goes wrong—say, an E. coli infection in a product for consumption—then it would be doable to find the source of the microbial contamination. Most people might not realize what happens in the production process; e.g., some quantity of milk comes from a dairy farm, and in the food processing plant, some components of a portion of the milk is separated into parts (whey separated from the cheese-in-the-making, fat for butter and the remainder buttermilk). To talk about parts and portions of such stuffs requires one to know about those stuffs, and how to model it, so there can be some computerized tracking system for swift responses. On the theoretical side, philosophers were talking about hypothetical cases of sending molecules of mixtures to Venus and the Moon, which isn’t practically usable, in particular because it was glossing over some important details, like that milk is an emulsion and thus has a ‘minimum portion’ for it to remain an emulsion involving many molecules. Foundational ontologies, which I like for their modeling guidance, didn’t come to the rescue either; e.g., DOLCE has Amount of Matter for stuffs but stops there, BFO has none of it. Domain ontologies for food, but also in other areas, such as ecology and biomedicine, each have their own way of modelling stuff, be this by source, usage, or whatever, making things incompatible because several criteria are used. So, there was quite a gap. The core ontology of macroscopic stuff aims to bridge this gap. This stuff ontology contains categories of stuff and is formalised in OWL. 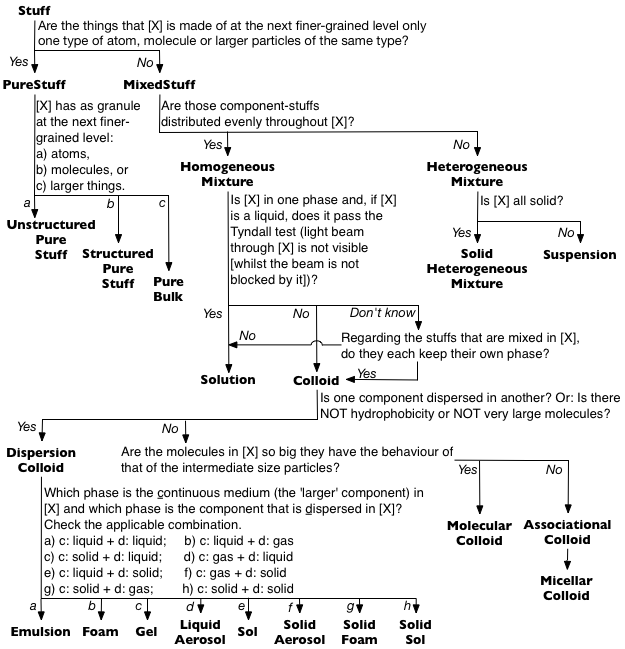 There are distinctions between pure stuff and mixtures, and differences among the mixtures, e.g., true solutions vs colloids among homogeneous mixtures, and solid heterogeneous mixtures vs. suspension among heterogeneous mixtures, and each one with a set of defining criteria. So, Milk is an Emulsion by its very essence, regardless if you want to assign it a role that it is a beverage (Envo ontology) or an animal-associated habitat (MEO ontology), Blood is a Sol (type of colloid), and (table) Sugar a StructuredPureStuff. A basic alignment of the relations involved is possible with the stuff ontology as well regarding granules, grains, and sub-stuffs (used in cyc and biotop, among others). The ontology both refines the DOLCE and BFO foundational ontologies and it resolves the main type of interoperability issues with stuffs in domain ontologies, thereby also contributing to better ontology quality. To make the ontology usable, modelling guidelines are provided, with examples of inferences, a decision diagram, outline of a template, and illustrations solving the principal interoperability issues among domain ontologies (scroll down to the last part of the paper). The decision diagram, which also gives an informal idea of what’s in the stuff ontology, is depicted below. You can access the stuff ontology on its own, as well as versions linked to DOLCE and BFO. I’ll be presenting it in Sweden at EKAW late November. Borgo S., Guarino N., and Masolo C.. A Pointless Theory of Space Based On Strong Connection and Congruence, in L. Carlucci Aiello, J. Doyle (eds. ), in Proceedings of the Fifth International Conference on Principles of Knowledge Representation and Reasoning (KR’96), Morgan Kaufmann, Cambridge Massachusetts (USA), 5-8 November 1996, pp. 220-229.